This chili sauce recipe is pass down from generation to generation in Indonesia. Sometimes the daughter will add more spice of maybe the grand daughter will less some spice but the most basic ingredients for balado sambal is shallot, chili, tomato puree together and saute with sugar and salt to taste. You can add a hint of asian spice if you prefer your balado sambal have a fragrant like mine, or maybe you can add tamarind or even shrimp paste to make a different kind of taste. Puree : shallot, red chili, green chili padi, garlic, turmeric with a mortar or blender until all the ingredients become a thick paste. Smash half part of lemongrass (the bottom part) to release more lemongrass fragrant when it cookes. In a pan, canola oil, stir in the chili paste, stir for a minute. Add the kaffir lime leaves and the lemongrass, saute until it's fragrant. Stir in tomato that have cut into cubes, add water, sugar and salt. Stir continuously in low medium heat until the tomato is disintegrated and all the water is run out. Taste, you can add more sugar or salt if necessary. 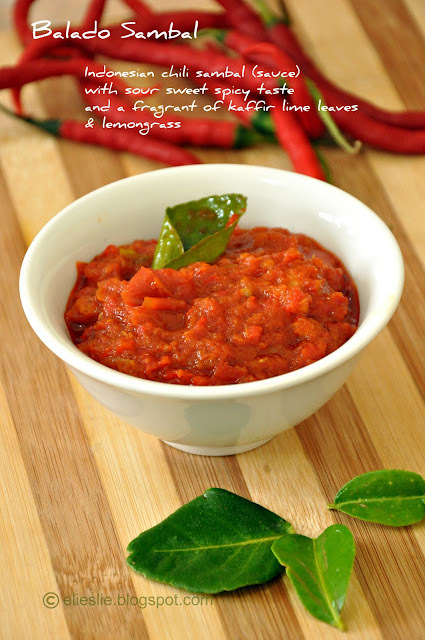 Balado sambal have a rich taste of flavor. A slightly sour taste from the fresh tomato, a sweet one from sugar and a little kick of hot from red chilli and a fragrant of kaffir lime leaves & lemongrass. You can experience with a different taste you prefer to add more of asian spice herb, as long as the original and basic ingredients is not less.